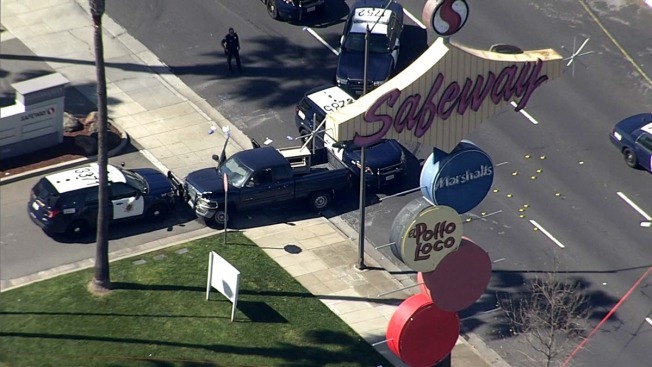 File image of the March 2017 scene where a naked man was shot by San Jose police in a shopping plaza off Stevens Creek Boulevard at Lawrence Expressway. Police in San Jose are accused of using excessive force in the shooting of a naked man who ran after a mother and child in 2017, according to a lawsuit reportedly filed this week. The San Jose Mercury News reports attorneys representing John Bradley Bowles filed the lawsuit against police and the City of San Jose on Monday. Bowles in March 2017 led police on a chase, crashing into several parked vehicles, before stopping at a shopping center on Stevens Creek Boulevard, where officers shot him. Police have said callers and witnesses reported Bowles, now 55, had been chasing after a woman and child while naked. View previous coverage of this story here. Read the San Jose Mercury News report here.